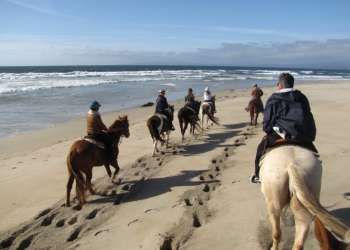 The newest state park in Monterey County, Fort Ord Dunes State Park has four miles of hiking and bicycling roads and four miles of shoreline. Interpretive signs describe both Fort Ord Dunes State Park&apos;s history as a training area for the United States Army and its current use as a habitat for endangered species. Even before Fort Ord Dunes State Park officially opened, it had become a popular site for bicyclists, hikers, runners and bird watchers. The beach is an excellent location to spot seals, sea lions and a wide variety of sea and shore birds. Visitors appreciate the contrast between Fort Ord Dunes State Park&apos;s natural beauty and the remnants of the military presence in the park. As Fort Ord Dunes State Park is the nesting habitat of the federally protected western snowy plover, please remain on paths and trails when visiting, and do not bring your dog or ride on horseback. The shoreline at Fort Ord Dunes State Park has a sharp drop-off, and the ocean has a significant undertow and surprisingly strong waves. There is no lifeguard at this beach. Please exercise extreme caution if wading or swimming at Fort Ord Dunes State Park. A campground is slated to open in the former munitions depot area. Check the California State Parks Fort Ord Dunes State Park web page for information on the current status of the campground. From Monterey and points south, take Highway 1 north to the Lightfighter Drive exit. Turn left on Second Avenue, right on Divarty Street and right onto First Avenue. Follow the small brown State Parks signs to Fort Ord Dunes State Park. From Marina and points north, take Highway 1 south to the Imjin Parkway exit. Turn on Second Avenue and follow signs to Fort Ord Dunes State Park.